How do I create an SMS poll? SMS polls are an easy way to find out what customers are thinking. Below are instructions on how to setup up an SMS poll. You need to first think of your SMS Poll question that you want customers to vote on. Once you have your Poll question in mind you then need to create autoresponders for each possible poll option. 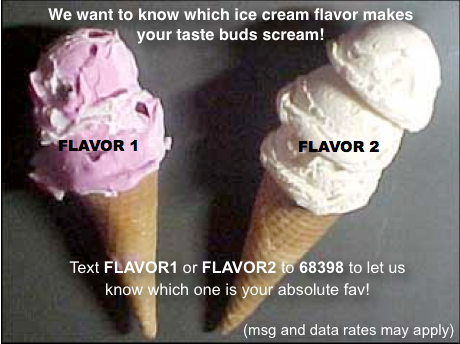 For example, if you wanted to ask customers what their favorite flavor was, either flavor 1, or flavor 2, you'd create two different autoresponders, the first autoresponder with the keyword FLAVOR1, and the second with the keyword FLAVOR2. Example below. 2. When it's time to calculate the winning option in the poll, log into Tatango, and the first thing you'll see is your campaigns dashboard, which lists all your campaigns. Beneath Campaigns on the left side of the screen, click Autoresponders. On the autoresponder dashboard, you'll be able to easily see which autoresponder received the most votes by looking at the numbers in the recipients column. That's it! If you want to limit customers to one vote per polling option (autoresponder), select the option within an individual autoresponder to only allow one response per phone number. Once that has been done, click Save Changes. You unfortunately can't limit customers from voting for multiple polling options (autoresponders), but that doesn't mean you can't instruct customers to only vote for one in your advertisement.